Named aptly so as she is quite a Southern belle! Who do I speak of? Well, see for yourself! This picture was taken after I picked her up yesterday. Obviously she was exhausted from her travels and is resting comfortably, even as we speak. Our plan is to give her a collar and possibly a straw hat to compliment her Southern charm. Then we will raffle tickets in hopes of raising many dollars for Second Chance Greyhounds. She will then find her forever home and will live happily ever after. 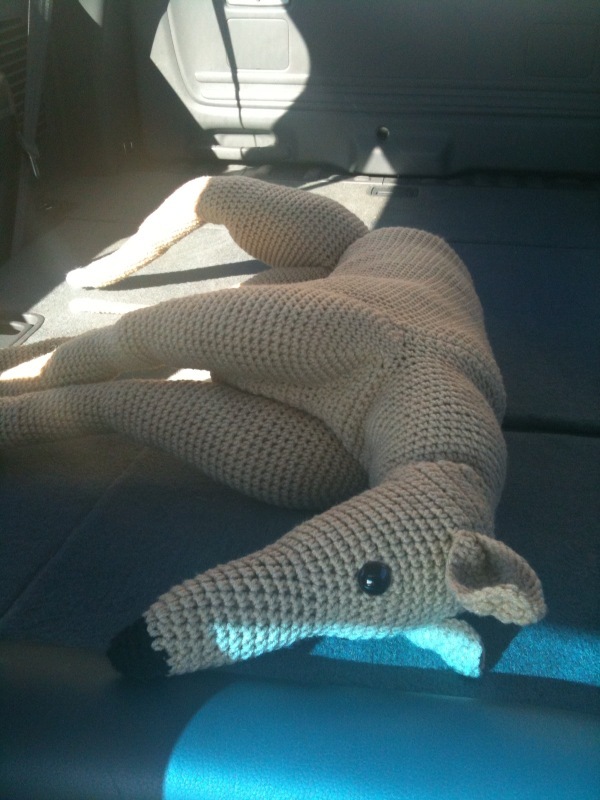 I'd like to thank Kathy Fowler for the many hours she spent crocheting Ms. Belle. It truly was a labor of love, I imagine, and we are forever grateful. Second Chance Greyhounds thanks you and the Greyhounds thank you!! I'll be sure to post an updated picture of Belle when she is fully attired!